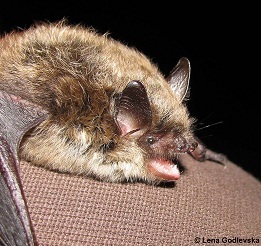 Slightly larger than M. mystacinus, it has a wingspan of 190 - 240 mm with relatively long ears and a long, light brown fur. For this species, mixed/broadleaf forests and water sources of high importance. Compared to other species, it is not so often found near human settlements. During summer it roosts in tree holes and trunk cracks, while in winter it chooses to hibernate in caves and mines. Tree lines and hedges are part of the species' hunting grounds. In these locations, and similarly to M. mystacinus, it uses aerial hawking to catch its prey. This species is an occasional migrant but the distances covered are usually no higher than 40 km. 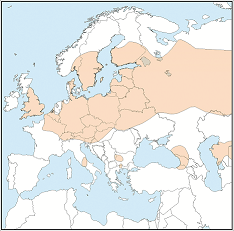 This species is predominant in central and northern Europe (Scandinavia and Russia (to 65°N)) but appears to have limited range within the Mediterranean region. There are no major threats known. Human disturbance to roosts in buildings and underground habitats may be a problem.